Australia will no longer export live sheep to the Middle East from June to August, starting 1 June, 2019. The RSPCA has cautiously welcomed the news the live export industry has made this commitment as a first step toward protecting Australian sheep, for at least three months of the year. However, the RSPCA says the moratorium must cover the entire highest-risk period of May to October, when the largest numbers of deaths occur; and it must form part of a measured plan to phase-out the practice for good. You can continue to support the campaign to end live exports by taking action below. The evidence – provided by a concerned whistle-blower working on the Awassi Express - finally shows what it’s really like on board a standard long-haul live export voyage from Australia to the Middle East. You can watch the story here, but please be warned - it’s very distressing. Australians have had enough, and it’s time to end live sheep exports. We have a real chance now to stop the cruelty, and the best thing you can do is make your voice heard by your political representatives. A meeting or phone call is most effective by far, but even a simple letter or email will help. We’ve prepared some talking points that you can use. Meeting with your MP in person is the most powerful action you can take. It’s important to remember your elected representative works for you and it is their responsibility to ensure your local community’s concerns are represented in Parliament. Check which electorate you live in here then enter your electorate name here to find your federal representative. Click on the name of your representative to display their contact details. Politely call your MP’s electorate office and identify who you are and what it is you would like to discuss at a meeting. Being prepared for your meeting will help make the most of your time. Check out the key talking points and make notes on what questions you would like to discuss. Bring along any petitions, letters or other documentary material you may wish to present to the MP. After your meeting, make sure you follow up with your MP to thank them for their time, summarise what was discussed and agreed, and to seek any further information. This can be done in a follow up email or phone call. Here are some key tips for writing an effective letter to your MP to ensure your voice on this important issue is heard. Keep your letter succinct and easy-to-read (one page is enough). Know your topic and decide the key points you want to make. Be polite, calm and factual in your tone. Explain why the issue is important to you. Read through and check your spelling and grammar. Always include your name, address and phone number so your MP can reply directly. If you can, hand deliver the letter to their electorate office. If you can’t meet with your MP in person, try to set up a phone appointment instead (note – if the MP is not available, it is still worthwhile speaking with members of their office who can relay your concerns to the MP). Here are some tips to help you get your points across. Write down the main points you wish to talk about prior to calling. Stay on topic and make your points as succinctly as possible. Be polite and maintain your composure as you listen to what the other party has to say. It’s a two-way conversation after all. Make notes about the responses they give. Leave all your details and make sure your call is registered. After your phone call, make sure you follow up with your MP to thank them (or their staff member) for their time, summarise what was discussed and agreed, and seek any further information. This can be done in a follow up email or another phone call at a later time. A hand-delivered letter is a powerful message, but if you’re unable to do this in person or by mail, follow these key tips for writing an effective email to your MP to ensure your voice on this important issue is heard. Keep your email succinct and easy-to-read. Click on the name of your representative to display their social media links. 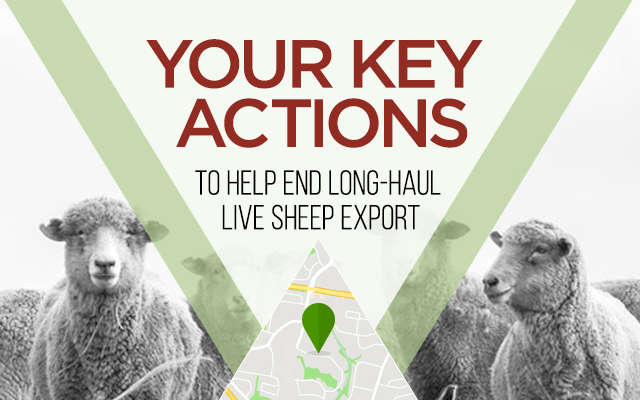 Help stop the suffering and end long-haul live exports of sheep by writing to the Federal representatives for your electorate.